You might very well be wondering how one would even start to analyse a conversation. What does one look out for when analysing a conversation? How would you transcribe a conversation? 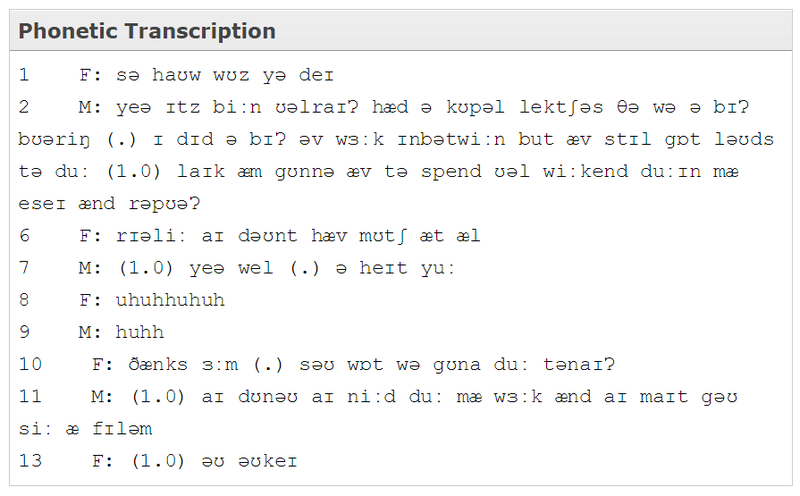 What even is transcription? Well hopefully this page might be a bit of use to you (and if you’re interested in learning more about transcription and the IPA system used in doing so, take a look at our page on Phonetics). Watching that you might think about how would we analyse this, and for what reasons? Well, let’s give it a go. The options below aren’t exhaustive, but just show examples of how conversation might be analysed. Since we have only one female and one male speaker present in the video, we’ll keep it simple and use ‘F’ to denote female speech and ‘M’ to denote male speech. 1) Simple transcription – by this we mean all we’re going to transcribe is the basic pattern of speech, focusing on little more than what was said and when. This approach might be useful if you’ve got a lot of data to transcribe and your focus doesn’t really necessitate going any further in terms of IPA transcriptions or paralinguistic features. Hopefully there shouldn’t be anything too difficult to grasp about this transcription. Brackets denote pauses, numbers within a bracket denoting how long the pauses was in seconds, with full stops within a bracket generally meaning the pause was less than a second in length but still significant enough to warrant noting. The numbers down the side simply add line numbers for referencing! Importantly though, we can still see conversational features such as turn-taking, and points where laughing occurs. These might be important features to help analyse a conversation. 2) Phonetic Trascription – the transcription below is a phonetic transcription of the conversation using the International Phonetic Alphabet (IPA). This sort of transcription might be helpful if one wanted to look at how accentual or phonetic features might affect conversation. For example, if you look at line 12 and see [fɪləm], this is a Newcastle variant on the pronunciation of the word ‘film’ – pronounced with an extra syllable in the coda of the word. Transcribing a conversation in this way then can help linguists research different varieties of a language and how they might affect conversation. 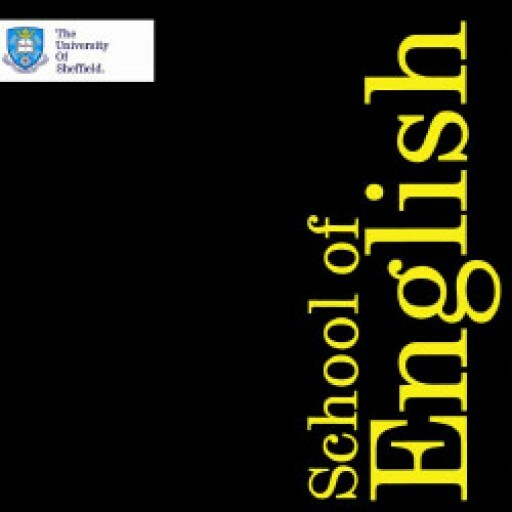 If you’re interested in learning more about varieties of English, you can do so by clicking here. If you have never seen or studied the IPA before, this might all look very confusing. Don’t worry though, the IPA just takes some getting used to and once you’ve learned the basic vowels and consonants, you’d be able to read this without any hesitation. But as previously stated, this sort of transcription can be very useful for people who want to analyse conversation at a phonetic level. There are many ways to analyse conversation using all sorts of confusing looking symbols called diacritics. These symbols can denote features such as word stress ( ‘ for example denotes primary stress for a syllable in a word), speaker intonation and even things such as false starts or unintelligible utterances. These are all tools used by academics to study and analyse conversation, but for us at the moment, are probably not worth delving into at such a level. Just be aware that conversation can be analysed in all of the ways mentioned above and however detailed one might want it to be! It’s all about choosing the correct transcription that will help you to analyse more effectively for your chosen focus.